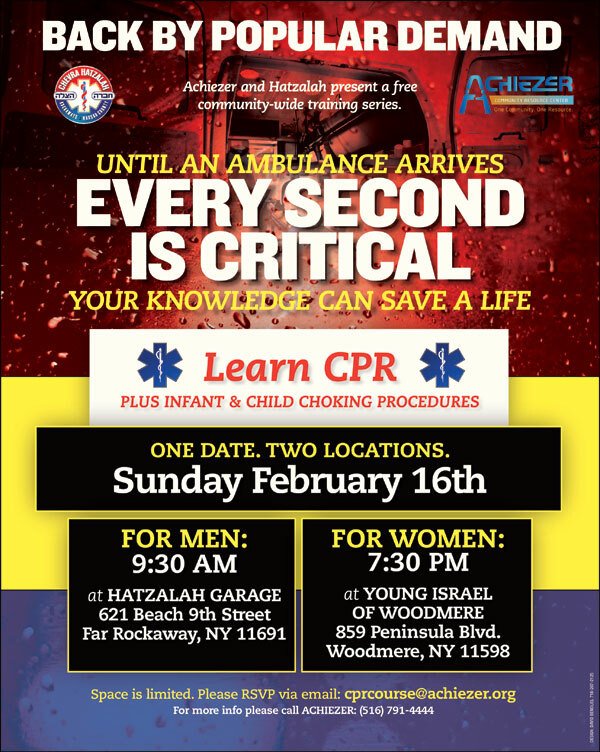 Once again, Achiezer & Hatzalah will be presenting a free community wide CPR training series. In addition to learning CPR, attendees will be taught choking procedures for infants and children. Classes for men and women will take place on February 16th at two different locations. The men's class will be held at the Far Rockaway Hatzalah garage, located at 621 Beach 9th Street and the women's class will be held at the Young Israel of Woodmere located at 859 Peninsula Blvd. To sign up, please email cprcourse@achiezer.org or call 516 791 4444. Space is limited, kindly sign up as soon as possible to ensure a spot in a class.